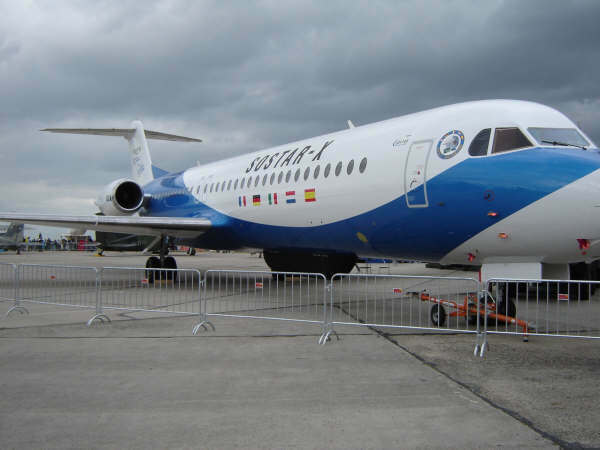 The Fokker 100 Stand-Off Surveillance and Target Acquisition Radar (SOSTAR) is a demonstration aircraft developed on the prototype of the Fokker 100 PH-MKH (serial number 11242) by the Dutch company Fokker (part of Stork Aerospace). The main difference is the 5 meters long SOSTAR radar under the forward fuselage (picture 2). Other extra's are a displacement of the antenna, installation of mission systems and cooling and supplies. The aircraft got an aircraft airworthiness license on 20 January 2006. With the radar and sensor to trace moving ground targets there will be flown tests to develop the NATO Alliance Ground Surveillance (AGS). The Fokker 100 SOSTAR operates from the Dutch military air force base Woensdrecht.